Growing construction market, expansion of metros & airports, upcoming new hotels & shopping malls, coupled with increasing infrastructure spending are few factors that have resulted in the overall growth of the UAE air conditioner market. Continuous growth in the construction market and increasing government spending towards infrastructure development has resulted in an increase on installation of air conditioners across UAE. According to 6Wresearch, UAE's Air Conditioner market is estimated to reach $1,019 million during 2015-21. In the UAE market, centralized, split and window type ACs have together captured majority of the market share in 2014 and would lead through the forecast period; however, share of window AC is expected to decline in the coming years. Amongst all the applications, residential application has generated largest share of the market pie in the country and would maintain its market leadership through the forecast period as well. The report thoroughly covers the air conditioners market by types, applications, and regions. The report provides the unbiased and detailed analysis of the on-going trends, opportunities/high growth areas, market drivers, which would help the stakeholders to decide and align their market strategies according to the current and future market dynamics. 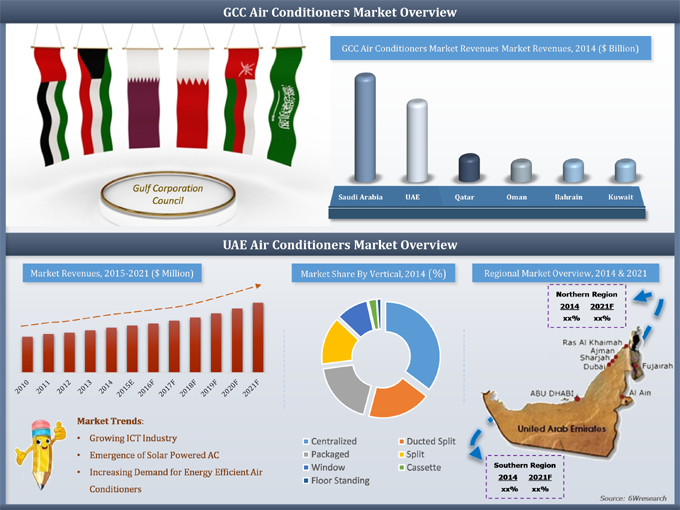 •	Historical & Forecast data of UAE Air Conditioner Market Revenue for the Period 2010-2021F. •	Historical & Forecast data of UAE Window AC Market Revenue & Volume for the Period 2010-2021F. •	Historical & Forecast data of UAE Split AC Market Revenue & Volume for the Period 2010-2021F. •	Historical & Forecast data of UAE Packaged AC Market Revenue & Volume for the Period 2010-2021F. •	Historical & Forecast data of UAE Free Standing AC Market Revenue & Volume for the Period 2010-2021F. •	Historical & Forecast data of UAE Cassette AC Market Revenue & Volume for the Period 2010-2021F. •	Historical & Forecast data of UAE Centralized AC Market Revenue for the Period 2010-2021F. •	Historical & Forecast data of UAE Centralized AC Market Revenue, By Components for the Period 2010-2021F. •	Historical & Forecast data of UAE Air Conditioner Application Market Revenue for the period 2010-2021F. •	Historical data of UAE Air Conditioner Regional Market Revenue for the Period 2010-2014. •	Market Size & Forecast of UAE Air Conditioner Regional Market Revenue until 2021F. 18.7	Samsung Electronics Co. Ltd.
Construction of new households, private business enterprises, new governmental and private buildings coupled with expanding public transportation networks have boosted the demand for air conditioners in the UAE region. Dubai being the host city of World Expo 2020 is expected to witness around 25 million visitors in the country. With such a high number of expected tourists, demand for new hotels would surge in the country, thereby increasing the demand for air conditioners. UAE air conditioner market has been segmented across various verticals such as residential, hospitality, retail, health care, commercial office, BFSI, government & transportation and others. Some of the prominent players in the market include Daikin, Fujitsu General, Hitachi, Johnson Control, LG Electronics, and Mitsubishi Electric Corp.